[ Seth Lister Mosley, Yorkshire naturalist. ] Autograph Letter Signed, regarding his plan to employ 'over 100 Board School Children' in 'Natural History Observations', and a natural history periodical 'got up & printed' by his children. On letterhead of the Huddersfield Naturalist Society. Huddersfield, 10 November 1885. 2pp., 12mo. Bifolium. In fair condition, lightly aged. An attractive letterhead, with lithographed engravings along the head of 'Argonauta Argo', 'Melanippe Hastata' and 'Veronica Officinalis'. A vigorous letter, the recipient of which is not named. He begins by stating that he has 'handed the two “Garners” to our Society'. He has 'for some time had a Phen. Sta. here (Beaumont Park Museum) & should be glad to work in co-operation with others. [Newman Hall, 'The Dissenters' Bishop'.] Autograph Letter Signed ('Newman Hall') to an unnamed recipient. [Albion Chapel] Hull [Yorkshire]. 25 December 1850. 2pp., 12mo. In good condition, on lightly aged paper, in a windowpane mount. It gives him 'much pain' to refuse the recipient's 'kind and friendly invitation': 'My Sundays for 12 Months are engaged. I fear some kind friends forget I am a settled Pastor & not at liberty to accept one twentieth of the Invitations I get. I have only a few Sundays which I feel I can consistently spend away from home - & these are generally engaged several months in advance'. 4pp., folio. Bifolium. In good condition, on aged paper. With covering leaf docketted: 'Minute of a Meeting of the Committee of Subscribers to the Monument recently erected by the Navy to the Memory of the late Lord Viscount Melville - held 24 January | 1827'. The document begins with a list of those present: 'Admiral Sir David Milne K.C.B. | Captain Tait R.N. | Captain Stoddart R.N. | Captain Dalyell R.N. | and | Michael Linning Secretary | Admiral Sir David Milne in the Chair'. The minute ends '(signed) D. M.', and is presumably the work of Milne, and in his hand. [Printed paper.] The 1988 Mountbatten Memorial Lecture. A Revolution in Communications. 8pp., foolscap 8vo. Nine photographic illustrations in text. Stapled into printed wraps. Good, on lightly-aged paper, with slight spotting to front cover. Scare: no copy on COPAC and the only copy on OCLC WorldCat at New York Public Library. From the Pat Hawker archive. [Printed paper.] Satellite Television Distribution: America Airborne. The 1980 Shoenberg Memorial Lecture of the Royal Television Society. Presented by Andrew F. Inglis, President, RCA American Communications, Inc., Princeton, New Jersey,. RCA American Communications, 400 College Road East, Princeton, N.J. [At the Royal Institution, London, England.] November 6, 1980. + 13 + pp., 4to. Twenty-five figures in text, and photograph of Inglis above a brief biography at the rear. Stapled. In good condition, on lightly-aged paper. From the Pat Hawker archive, with his ownership inscription on the front cover, and the addition by him of '& CABLE' to the title, also the note by him 'Shows Cable penetration etc.' 'RCA American Communications, Inc., owns and operates the RCA domestic satellite communications system. This consists of two in-orbit satellites plus a growing network of earth stations in major U.S. cities. [Printed programme.] Scottish National War Memorial. Opening Ceremony by H.R.H. The Prince of Wales, 14th July 1927, and Visit of Their Majesties The King and Queen. 15pp., 8vo. Pamphlet. 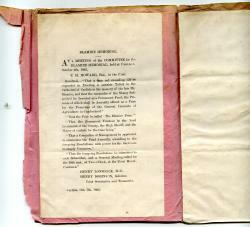 Fair, on lightly-aged paper, with rusting staple, and strip from mount adhering to margin of title. A change in the order of ceremony has been marked in red ink, and the section on the Seaforth Highlanders has been indicated in blue ink. From the papers of Regiment's Colonel, Maj.-Gen. Sir C. J. Mackenzie, KCB. A scarce piece of Scottish military ephemera: the only copies on COPAC and WorldCat are at Oxford and the National Library of Scotland. 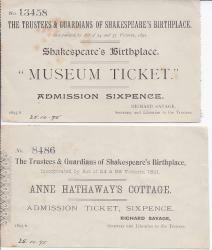 [Victorian printed Shakespeare ephemera] Illustrated 'Description' of Shakespeare's Birthplace, together with tickets of admission to it, and to Ann Hathaway's Cottage, and a letterhead of the Shakespeare Memorial, carrying notes of books. A nice collection of Victorian Shakespeare ephemera. 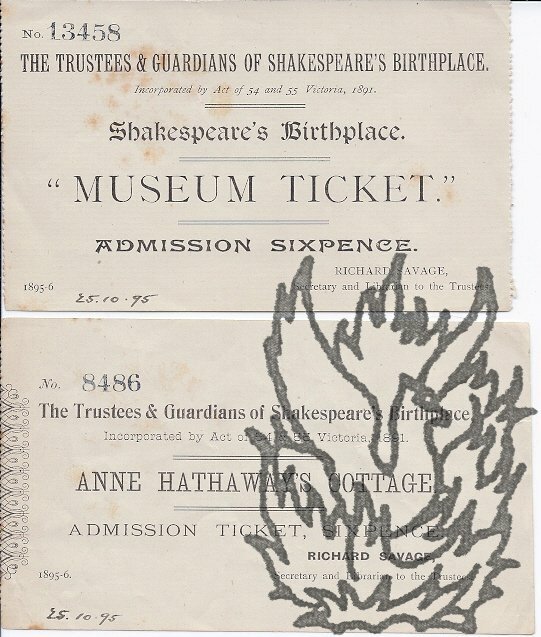 All four items with text clear and complete, on lightly-aged and worn paper. The 'Description' is printed in red, on both sides of a piece of paper 13.5 x 18 cm, with both vertical edges perforated. 'This may be retained as a Souvenir' along one edge. Dated at end 'RICHARD SAVAGE, Secretary and Librarian to the Trustees. | 1896-6.' Along head of first page: 'The Committee request that no Gratuities be offered to the Attendants.' Numbered 22989 in black. 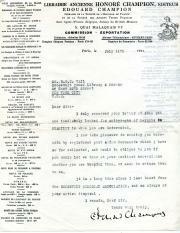 Typed Letter Signed, in English, to R. W. C. Vail of the Roosevelt House Library and Museum, with typed invoice. Both items dated 11 July 1924, and both on his letterhead. Both items fair, on lightly-aged paper. Both with list of Champion's publications down the left-hand margin, and with the list continuing in the letter to the blank second page. Letter: 4to, 1 p. He is sending 'a few documents which I have so far collected' relating to the Marquis de Chamilly. 'It is a long time since I last heard from the ROOSEVELT MEMORIAL ASSOCIATION, and am always at your entire disposal.' Invoice: Landscape 8vo. 12mo, 1 p. Containing five Chamilly letters, totalling 268 francs. Printed handbill proposing the establishment of the Blamire Memorial. With five Autograph Letters Signed (by the peers Cleveland, Devonshire, Feversham, Lonsdale, Spencer) to Howard on the same subject. All six items dating from 1862. 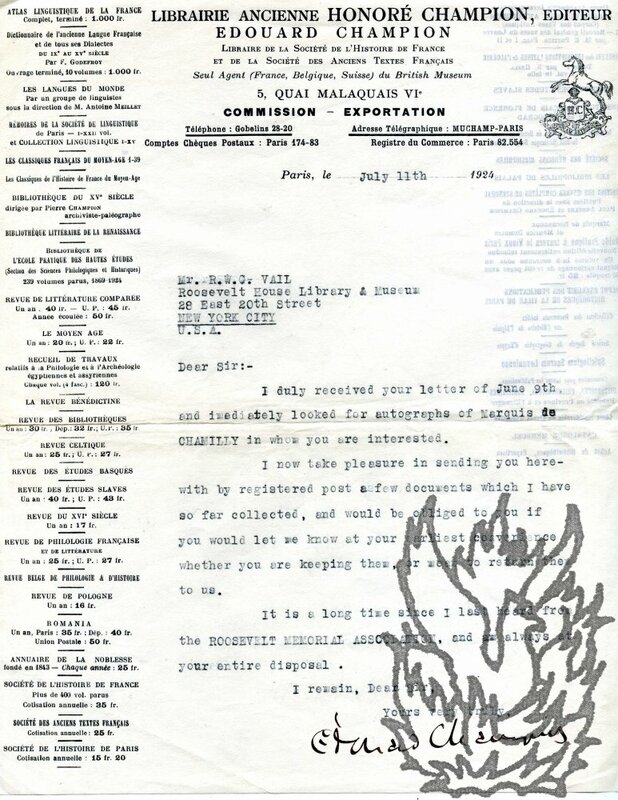 An interesting collection, with some revealing comments within the correspondence. All six items are laid down on a folio leaf of pink paper removed from an autograph album. All clear and complete, in good condition on aged paper, with the Feversham letter somewhat grubby. 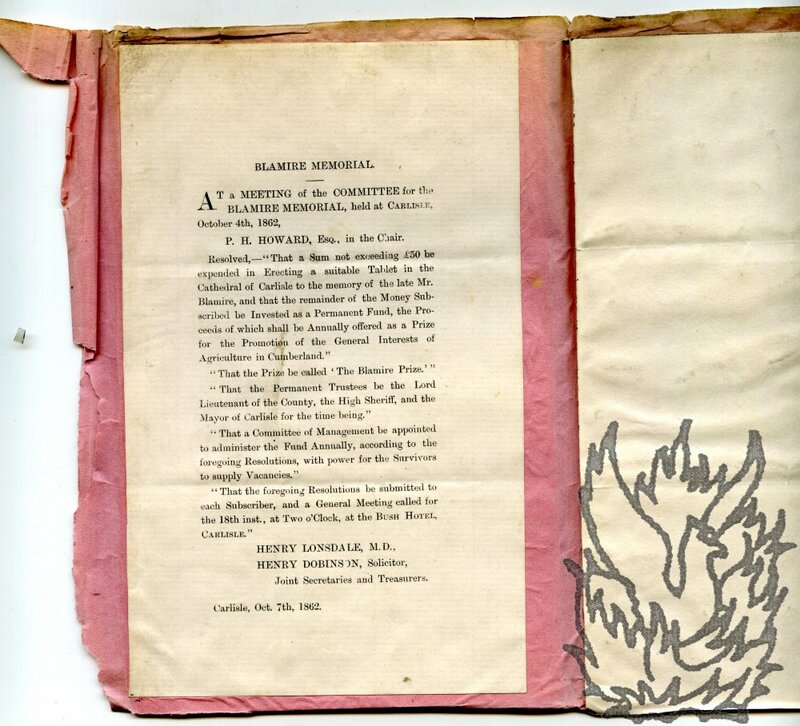 The handbill (12mo, 1 p), on behalf of the Committee for the Blamire Memorial, and in the names of Henry Londsdale and Henry Dobinson, is headed 'BLAMIRE MEMORIAL', and dated 'Carlisle, Oct. 7th, 1862.' It reports the resolutions of a meeting held on 4 October 1862. Letter in secretarial hand signed by Webb ('Aston Webb') to Alice Bertha, Lady Gomme (1852-1938). One page, octavo. Good, on lightly aged and creased paper. 'Pray use me as you think fit on Monday March 4th. & I will do what I can | Perhaps you would not mind telling me if it is to be in reply to a toast & if so what & also whether decorations are worn. I imagine it is more or less of a private dinner & therefore they will not be'.